Many projects involve some component of research or interpretation of data. Research is often the basis for developing a program. Fortin Consulting can conduct literature searches, interviews, observations, prepare reports and present results. FCI researched winter maintenance practices for parking lots. The research included interviews of plowing contractors and building managers, observations of practices, and gathering of data. FCI observed, documented, and analyzed boater behavior in relation to AIS signage. FCI reviews county wide volunteer stream monitoring data. Looks for errors and omissions, new types of data that may be gathered in future monitoring and suggests changes in protocol that might improve results. FCI analyzes the data and prepares an annual report on the state of the rivers for the county to distribute. FCI wrote TRS 1411 for the City of Burnsville and Minnesota DOT on Chloride Free Ice and Snow Control alternatives. It looks into alternative products from chloride, alternative pavements, and at changing public expectations and behavior. FCI contributed to the Twin Cities Metropolitan Area (TCMA) Chloride Management Plan, and is involved in expanding this plan to a statewide plan. Our research involved mining knowledge and recommendations from winter maintenance experts throughout the state. 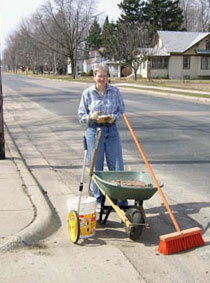 FCI tested fertilizer spreaders to determine the variation in spreading patterns and amounts. FCI inspected lawn fertilizer bags to determine contents and directions and compared these to the professional recommendations developed by the technical expert group for the turfgrass maintenance training. FCI then developed simplified recommendations to provide to citizens. FCI identified and inspected pet stores and nurseries to determine if they were selling aquatic invasive species and prepared a report on our findings. FCI is currently working on an LCCMR project looking at residential water softening and identifying practices to help reduce the amount of salt entering our waters from this source. FCI conducted a literature search on the fate of 2,4-D in aquatic environments and prepared a report summarizing the findings. FCI worked with Dane County, Wisconsin to develop salt application rate guidelines for parking lots, sidewalks and trails. FCI synthesized from various sources the lifecycle cost of salt use that is now an MPCA publication. Scientific data presented in a readable, understandable and usable format.